One of the bloggers that really inspired me to start DIY-ing furniture is Ana White. I’m so amazed at all of the things she’s come up with. She lives in Alaska with her family, and one of the most recent things she (and her husband) built was a cabin. A CABIN, for crying out loud. How can I not admire someone who builds one with her own bare hands? Plus, she has loads of free plans on her site – several of which I want to make! Anyhoo. It took me a while to start on my first project. It’s not like we have a Home Depot in the Philippines, or easy access to power tools. Normally, we leave the carpentry work to, well, the carpenters. But I’ve always wanted to give it a try. My dad looked at me like I was crazy when I told him a few months ago that I wanted to build my own dining table. He said it was easier to just buy one. True, but it wouldn’t be as fulfilling. This project took about a month and a half to complete, only because I only spent a couple of hours working on it at a time. 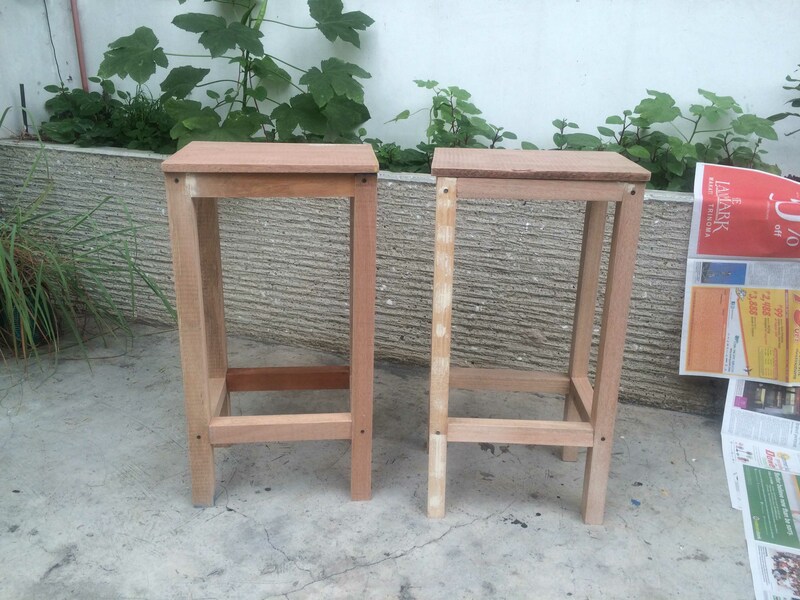 Initially, I just wanted to make a little rolling side table to put next to the couch. I went to Wilcon and picked out the wood I wanted. I bought several 2×2’s, some 1×4’s and a couple of 1×6’s. 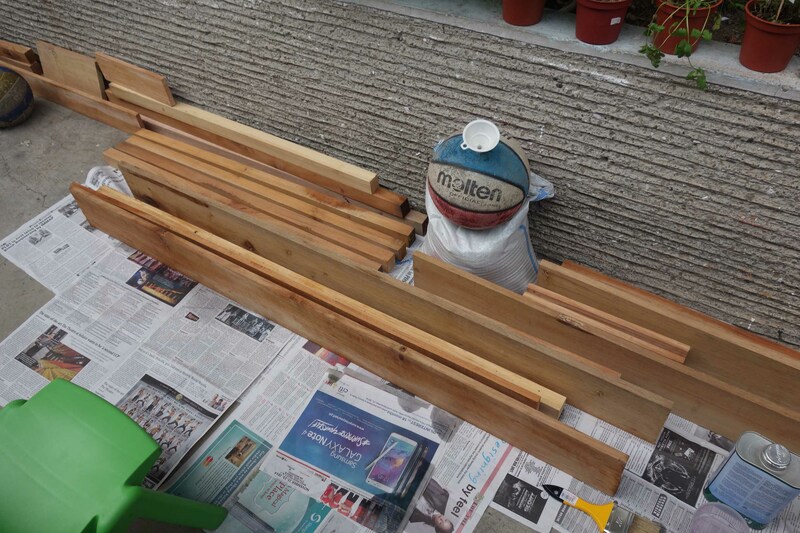 They delivered the wood to my house a few days later, and only the weekend after was I able to start on my project. 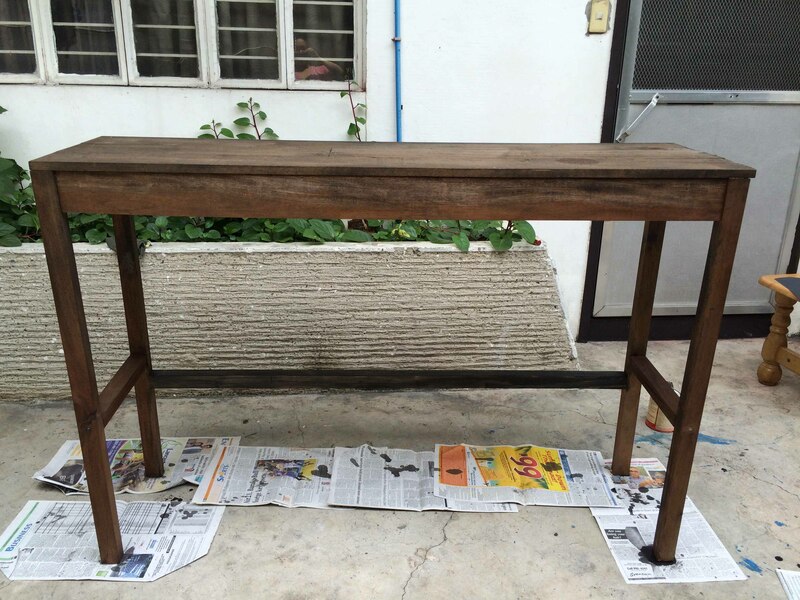 While waiting for the delivery, I decided to make e a bar-height desk. My house is a little small, so I wanted a table that wouldn’t take up too much space. I designed it myself and made a crude drawing of how I wanted it to look, and wrote down the dimensions. 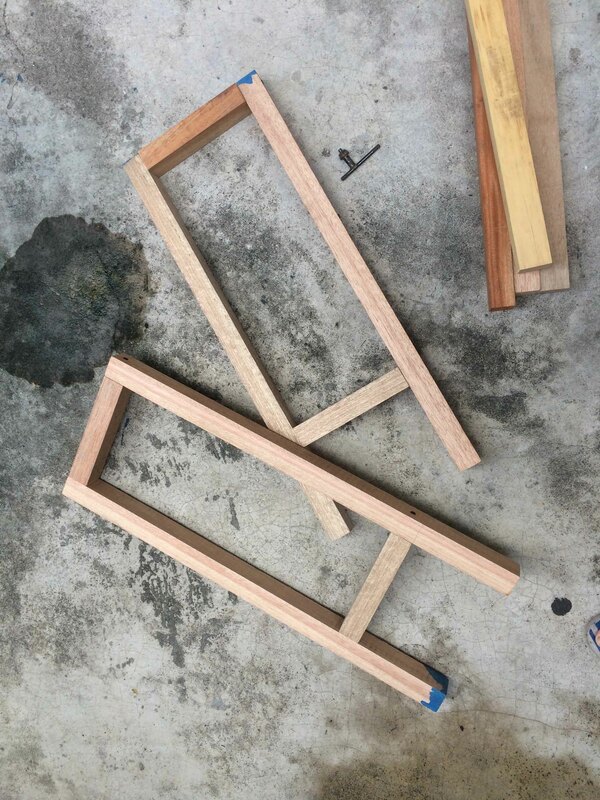 First I measured the pieces of wood, then I used my circular saw to cut them. 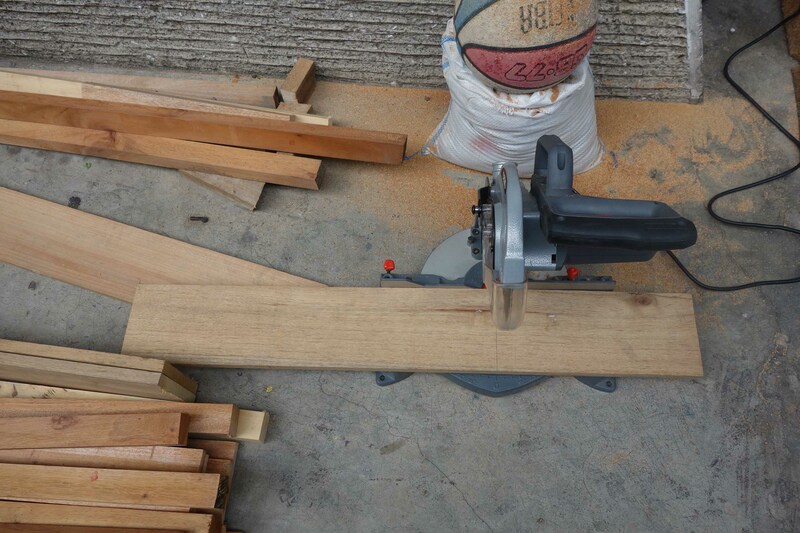 I read somewhere that in order to cut wider pieces of wood (because the maximum width is 4 inches), all I have to do is place another piece of wood under and make the cut as usual. i had to put the saw on the floor and do my cutting there, because we don’t have a work table. Here are the pieces, all cut, and treated with Solignum (to prevent termites). Please disregard the ball and sack of sand – my husband was trying to make his own medicine balls. Next I used my Kreg Jig to drill pocket holes in the middle plank for my table top, which is 5 feet long and 18 inches wide. I’ve had the jig for over a year but used it for the first time for this project. 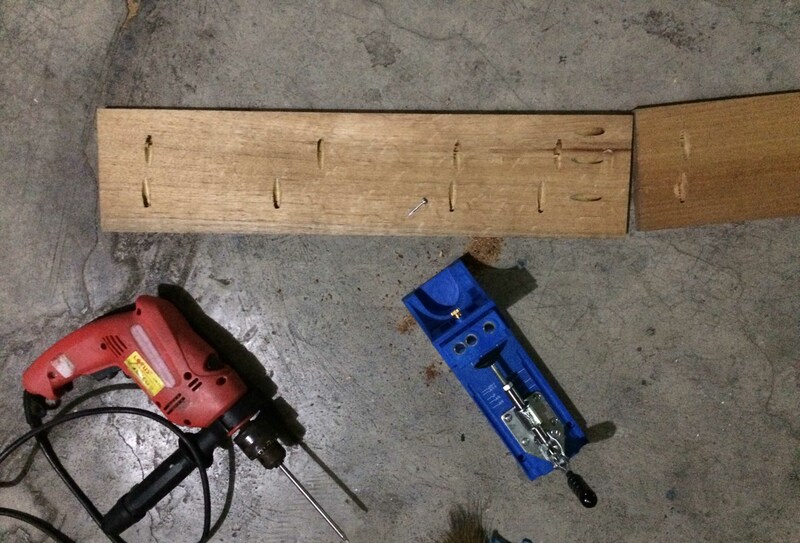 And apparently, I used the wrong measurements to drill the holes but it’s a good thing they turned out fine! 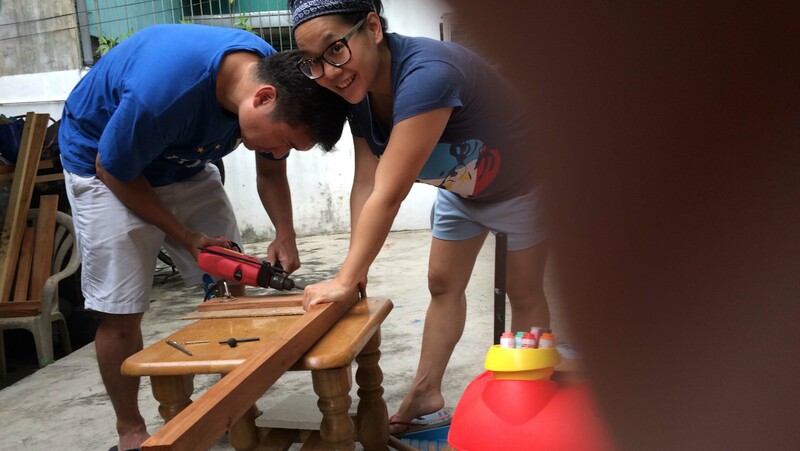 Here we are, screwing the base together on our makeshift work table. Not the safest thing to do, I know. 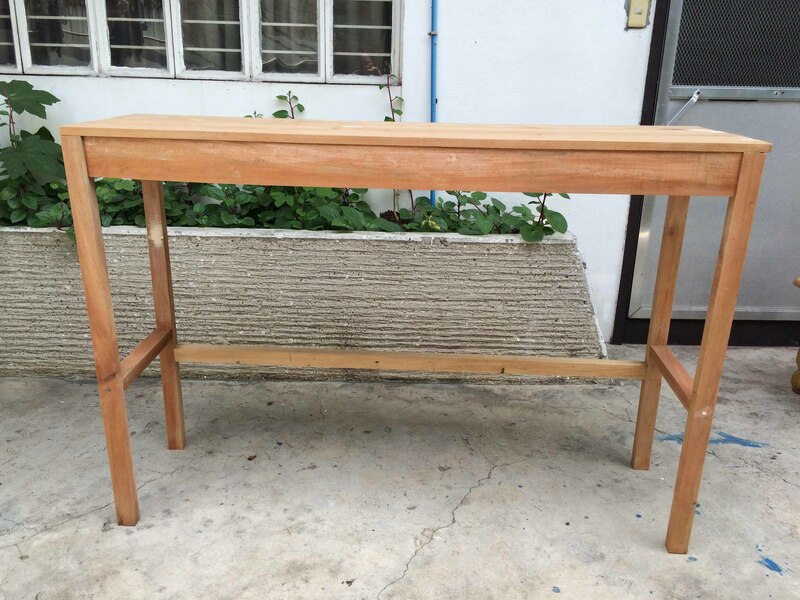 A work table is also on my list of things to build. Please disregard that little finger on the right. Our daughter took our photo while we were working. Fine, I asked her to take our picture and she ended up taking loads. Julio’s job was to pre-drill and put the screws in, because I wasn’t too confident to do it myself. 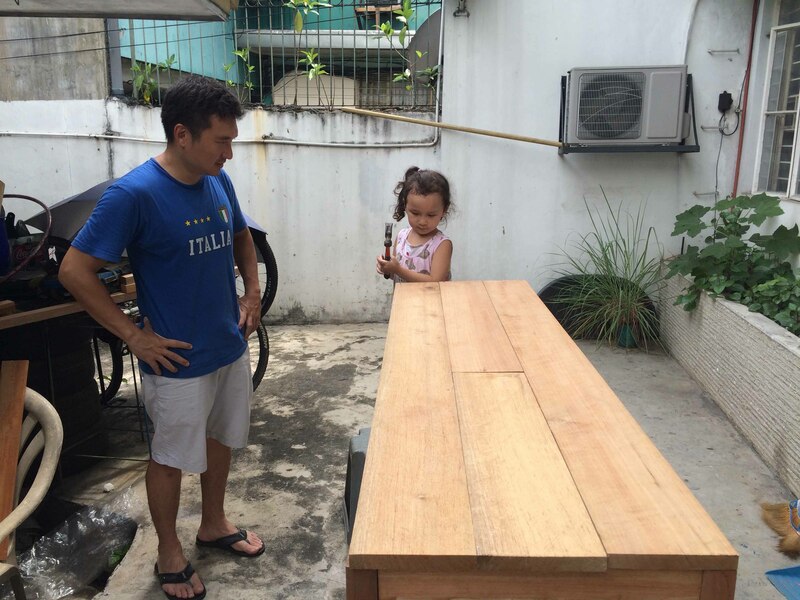 Bea saw us (Julio, mostly) nailing the table top to the base and wanted to give it a try. Here is the table, sanded and with holes filled. And here it is, all done! I stained it with a color called Red Mahogany. 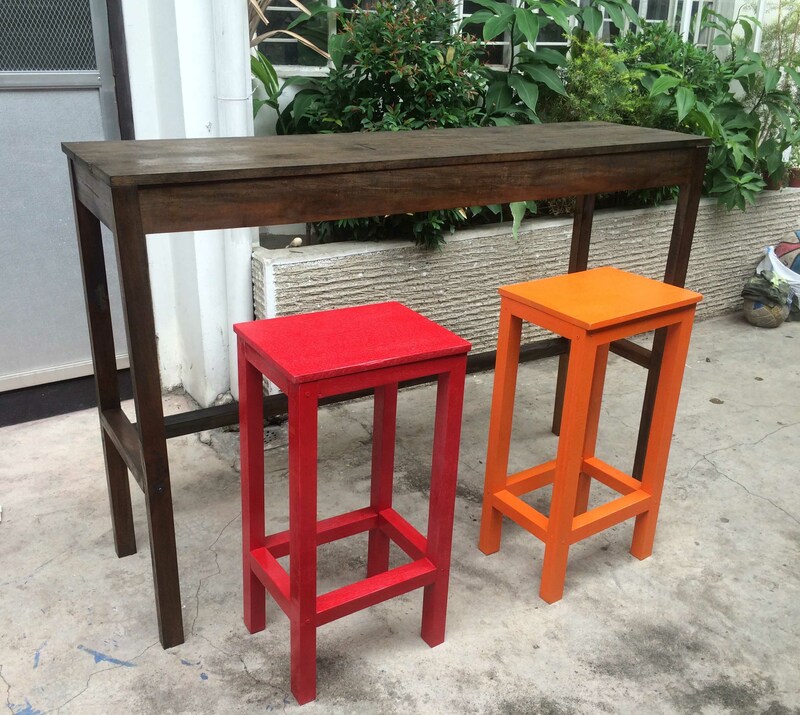 I wanted to buy stools to go with it, but I couldn’t find any that I liked so I decided to build it myself. I got these stool plans from Rogue Engineer, and they were pretty easy to follow. I ran out of 2×2’s though and needed a 1×12 plank so I went to the hardware store close to my house to buy them. Let me tell you, Wilcon is NOT the place to buy wood. It’s incredibly expensive! Although, I have to admit that the quality of the wood is superior to that of the smaller hardware stores. This new batch I bought needed a whole lot of sanding and seemed to be a softer kind of wood. But if you’re on a budget, go to your neighbourhood hardware stores. Your wallet will thank you for it. Here’s the unassembled base of one stool. I had to make the foot rungs for one stool higher, so it would suit my height. And here they are, waiting to be primed and painted. I’m not sure if I’ve mentioned it before but the paint colors you can get in Manila are pretty limited. I bought Rust-Oleum spray paints instead, in Cardinal Red and Orange. The orange one is Julio’s and mine is the red. I gave them all a coating of polyurethane, left them out to dry for a day, and put them along one wall of our ground floor. The stools were a good idea, because I can just push them under the desk if I need a little more space. Not bad for first-timers, huh?